They traveled from nearby Chandler and as far as 300 miles––from Flagstaff and Thatcher, San Carlos, Yuma and the Four Corners Region. 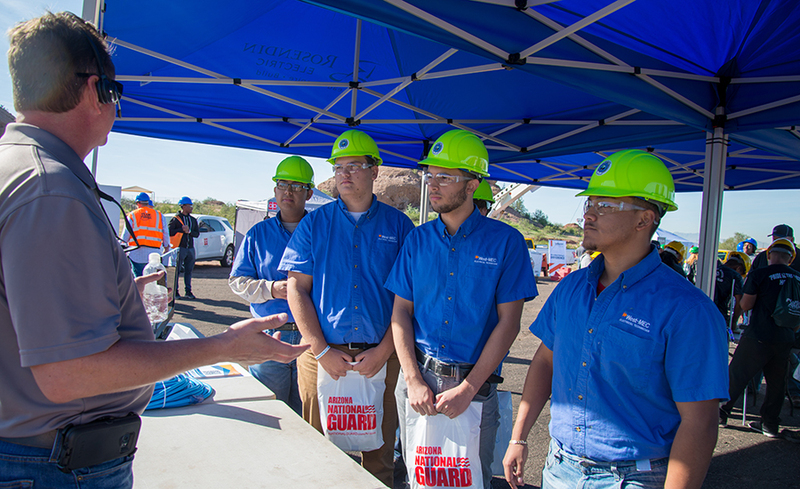 Approximately 2,800 high school juniors and seniors from 100 schools in 10 Arizona counties attended the 16th annual Arizona Construction Career Days, “Building Tomorrow’s Workforce Today” Nov. 1 and 2 at the Arizona National Guard in Papago Park, Phoenix. A week later, Nov. 7 and 8, a similar program, Southern Arizona Construction Career Days, welcomed an additional 2,300 students to experience construction-career pathways in Tucson. The young men and women came looking for their futures. Edward Christensen of Tempe, Ariz., also attended last year’s event while a student at Camp Verde High School in Camp Verde, Ariz., about 90 miles north of Phoenix. This year, he attended as an employee at Gilbert-based JFK Electric. “The event last year helped me by letting me see the different trades I could get in to,” he says. 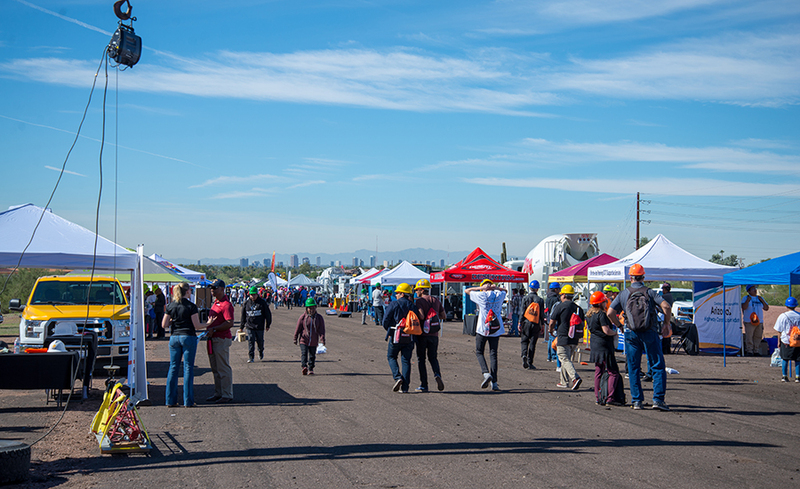 Presented by the Association for Construction Career Development (ACCD), Phoenix, the state’s largest such event provides construction experience for high school students to learn about the increasingly diverse and high-demand careers in the construction industry. A 501(c)3 non-profit, ACCD was created in 2007 to support the annual workforce development events. 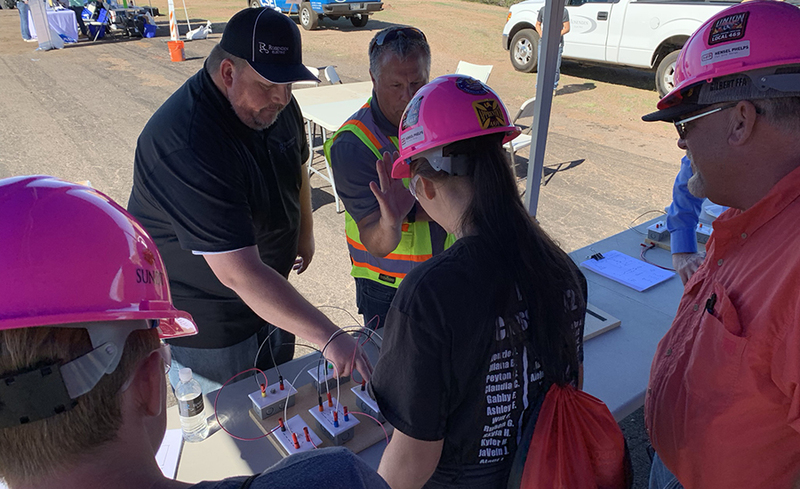 Wearing variously colored construction hats to identify their schools, students visited 60-plus exhibitors’ stands, many offering hands-on demonstrations such as pipe-welding, underwater welding, electrical switching and heavy machinery operations. Another student, Tyler Thomas, will serve four years in the Air Force after he graduates from Flagstaff High School. 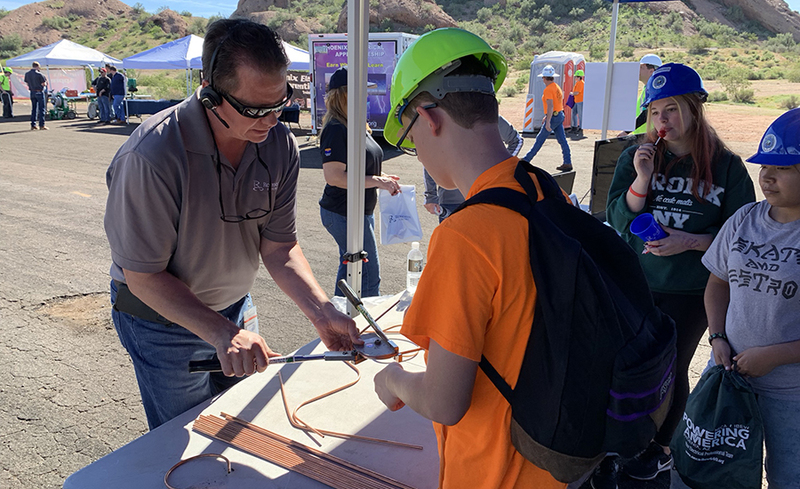 He’s worked for a New Mexico contractor and enjoyed seeing this year’s hands-on demonstrations at Career Days in Phoenix––in particular, the underwater welding. “It’s given me lots of brochures and lots of hands-on experience,” he says of the event. Hosting the stands were contractors such as McCarthy, Sundt and Centuri, vendors and trades, including Rosendin Electric Inc., a platinum sponsor of this year’s event. “One reason we’re involved with this event is that we know we need to do a better job as an industry talking about ourselves,” says Brandon Stephens, division manager for the Tempe regional office of Rosendin, based in San Jose, Calif.
Construction may never be a glamour industry, but its members must enhance its attractiveness for today’s young person. “We need to modify the message that there is more to construction than just digging a ditch or framing homes in the summer in 110 degrees,” he says. With annual revenues surpassing $2 billion, the employee-owned electrical contractor is one of the country’s largest electrical contractors, ranking No. 7 in the ENR Top 600 Specialty Contractors 2018 list. Employing about 6,000 people, the company serves many niches, including heavy industrial, high tech, instrumentation, data and controls. Rosendin has had a Phoenix-area office since 1996. In addition, the next generation of construction professionals must be trained to design and build smarter. “New skillsets are needed, because technology is changing the way we build buildings, from building automation to virtual and augmented reality, where we can now manipulate tools as they would be on the site but on a computer,” he says. Construction is robust throughout the country, particularly in Arizona. In October, Arizona Gov. Doug Ducey’s office issued a proclamation showing Arizona gained more construction jobs than any other state year-over-year from June 2017 to June 2018 and encouraged schools statewide to help students find opportunities. In addition, the Associated General Contractors of America, in analyzing government data, said that construction employment nationally increased by 30,000 jobs in October and by 330,000 jobs during the past year, surpassing 7.3 million for the first time since April 2008. And, the industry’s average pay increased and unemployment decreased to a historic low. Still, women constitute only 13% of construction workers, according to recent U.S. Bureau of Labor statistics. And, despite the significant gains in employment and pay, the AGC says contractors continue to struggle to find qualified workers. Public-private partnerships ensure the success of the annual event, including the Arizona Department of Transportation, the Arizona Department of Economic Security and the Arizona Registrar of Contractors. For more information, visit www.azccd.com and www.rosendin.com.